Kill roots clogging septic tank pipes – flush down the toilet. 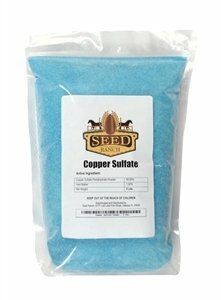 Copper Sulfate Powder (Pentahydrate) – 5 Lbs. **Made in the USA from the Highest Grade Material. A versatile farm chemical: Pest control – snails and slugs Pond cleaner – algae, mosquito larvae Natural fungicide mildew Antiseptic – household germs Organic Bordeaux mix – blight, apple scab, leaf curl, etc. ); Remove old tree stumps (bore a hole and insert Kill roots clogging septic tank pipes – flush down the toilet. Wood and canvas preservative (prevents dry rot), …or simply grow lovely blue crystals.